The ideal candidate – to begin in April of 2017 - is a suitably experienced leader with a demonstrated ability to engage with the members, Council and senior stakeholders of the RDA, and the ability to be a key driver of the RDA mission of rapidly building the social and technical bridges that enable sharing of data. The appointment to this position is intended to be for two years and renewable. The employment vehicle for the Secretary General is a contract between the Research Data Alliance (RDA) Foundation and an organization willing to host the Secretary General. Queries about this role can be made to John Wood <john.wood@acu.ac.uk>, co-Chair of the RDA Council. 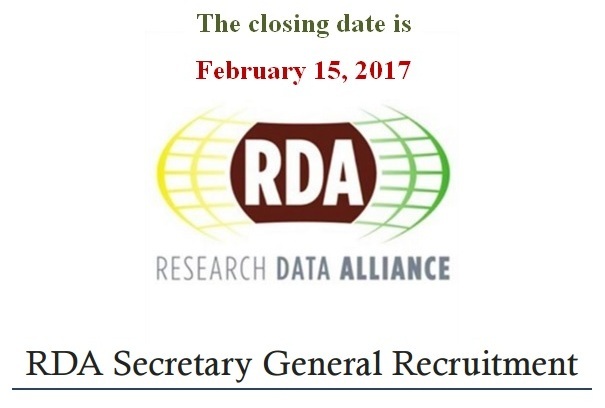 Applications for this role should be sent to applications@rd-alliance.org. The closing date is February 15, 2017. Please view the official recruitment announcement for further details on the Secretary General responsibilities, the selection and appointment process.